The Select Committee on Civic Arenas voted Friday to forward a $700 million KeyArena renovation proposal to the full city council for a Sept. 24 ratification vote, which would clear the way for an NHL expansion team to be awarded for the 2020-21 season. A proposal to renovate KeyArena for $700 million is now one final step from political approval after a Seattle City Council committee on Friday approved submitting the deal to a full council vote. That Sept. 24 vote would clear the way for the renovation to begin this year after the Select Committee on Civic Arenas unanimously approved forwarding the deal. The council vote will also come just more than a week before the NHL Seattle group and Seattle Mayor Jenny Durkan travel to New York to give a presentation to the NHL executive committee on our city’s bid for a hockey expansion franchise. 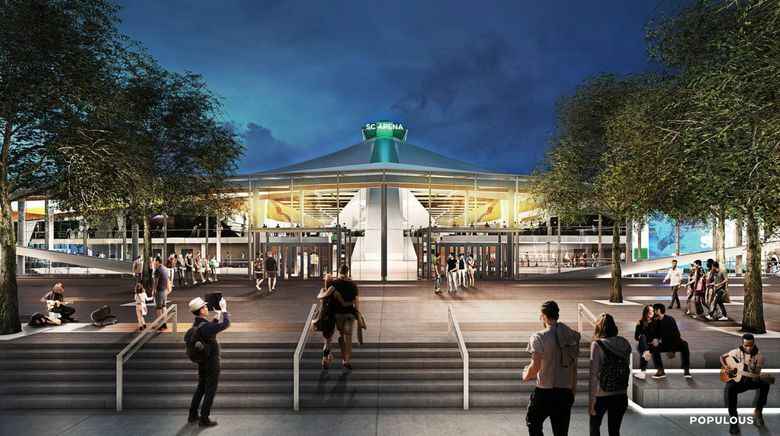 The Los Angeles-based Oak View Group (OVG) — headed by Leiweke’s older brother, Tim — is the KeyArena project’s developer, chosen last year by the city over a rival proposal from the Seattle Partners joint venture of Anschutz Entertainment Group and Hudson Pacific Properties. Tim Leiweke and OVG first announced intentions to submit a renovation proposal two years ago next month and it’s been an arduous ride since, not only in besting the Seattle Partners proposal but also fending off a public relations effort by a rival group looking to build a brand new venue in the city’s Sodo District. A Memorandum of Understanding was reached a year ago this month between the city and OVG and finalized by the council last December. Days later, the NHL announced it would accept an application from future team owners David Bonderman and Jerry Bruckheimer for a Seattle expansion franchise priced at $650 million. Getting the council to fully sign off on the arena renovation ahead of the NHL executive committee meeting Oct. 2 is seen as paramount to the franchise gaining approval. “This is going to bring Seattle Center back to being the center of Seattle,” Councilmember Sally Bagshaw said just before Friday’s vote to forward the package to the full council. Only two council members — Mike O’Brien and Kshama Sawant — did not attend Friday’s meeting. Given the unanimous approval of the voting package Friday by the seven other councilmembers, the likelihood of the project being defeated in a full council vote Sept. 24 seems remote. “I’m very, very pleased with where we’ve reached,” Council President Bruce Harrell said. Harrell co-chaired the committee, along with Debora Juarez, through many hours-long meetings since it was formed in the spring of 2017 to pore over arena renovation proposals and help craft final agreements between OVG and the city. Juarez in particular took a lead role in the committee’s activities and was highly outspoken about the value of the deal to the city’s taxpayers. The council committee’s approval Friday of the renovation package to be voted on came after some late amendments that included diverting at least $1.3 million in annual arena admissions tax revenue towards arts and cultural programs. Councilmember Lisa Herbold also withdrew part of a motion she’d presented calling on OVG to create a mitigation fund of an unspecified dollar amount to compensate Seattle Center tenants that suffer from a loss of revenue once construction begins. Herbold said she was withdrawing the proposal after OVG objected to the fund as a “completely new business ask” in late stages of negotiations. If the NHL executive committee approves of the Seattle franchise bid, it could be forwarded to the league’s full board of governors for an early December vote to grant a team. The city council has insisted on the team being approved before the KeyArena renovation begins, but fine print within its deal with OVG allows for waivers that could allow demolition to start ahead of that. A positive recommendation by the league’s executive committee after the Oct. 2 presentation by NHL Seattle and Durkan could allow for those waivers. The political process surrounding our city’s yearslong arena debate took a leap forward on Thursday when a deadline to appeal a final environmental impact statement on the KeyArena renovation came and went with no takers. Any appeal could have delayed the renovation by at least three months and threatened the targeted October 2020 completion date for construction. OVG had built a three-month delay into its construction schedule, which would have allowed any frivolous appeals to be dismissed by the City Examiner’s Office without impacting the arena’s 2020 reopening. But a more serious appeal — pertaining directly to impacts on the surrounding neighborhood — could have delayed the reopening and ended the chance of an NHL expansion team beginning play there during the 2020-21 season. OVG and NHL Seattle both worked feverishly in recent months to head off potential appeals by neighborhood stakeholders that had expressed concerns about the project. Now, with the appeal threat removed, the NHL Seattle group can lobby the league for a team with greater assurance it can meet that 2020-21 regular season target.